Born in 1955 in Baltimore, Jonathan Meath studied at New York University, graduating with honors in 1979 before embarking on a lucrative career as a children’s television producer, with arguably his most famous credit being that of senior producer for almost 300 episodes of Where in the World is Carmen Sandiego? During his career, Meath also worked with The Jim Henson Company producing episodes of The Wubbulous World of Dr. Seuss as well as helping to develop various Nickelodeon and Discovery Kids shows. It’s likely that Meath would have continued in television until his retirement if not for the the fact that for almost of his adult life he sported a full beard. Why does this matter you ask? Well, when Meath entered his late 40s in the early 2000s, his hair and beard began to whiten considerably which made him, like all mildly tubby older men sporting a giant fuzzy beard, kind of look like Santa. As Meath would later recount in an interview with WGBH News, so many kids began mistaking him for Santa that, in 2002, his wife thought it’d be funny to buy him a Santa suit on Ebay for Christmas. So the next year, he dusted off the suit and scored a gig as a mall Santa, something he describes as “one of the most wonderful experiences in the world”. Eager for more of the ultimate Christmas high, Meath decided to try and pursue portraying Kris Kringle full-time. So how does one go about becoming a year round, premiere Santa Claus? A good bet is to first go to Santa school. Seriously. As for Meath, he attended the International University of Santa Claus in 2006, earning a Master of Santa Claus degree- something we are absolutely not making up. 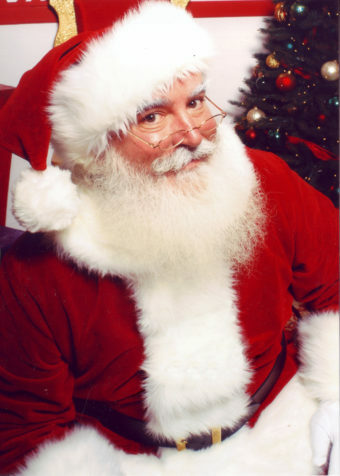 Along with teaching the basics of the history of Santa Claus and the various traditions surrounding the character throughout the world, universities such as this also typically instruct potential Kringles on everything from beard maintenance and makeup, to how to drive a sleigh (sometimes with on-hand reindeer and all). Less obvious courses that come with the territory include contract negotiation (Santa’s gotta eat too), how to dance, how to deal with parents, and even how to make wooden toys. Perhaps most important of all is they teach the future Santas how to address common requests and questions from children. While this might seem like a simple thing, and in most cases it is, there are edge cases where a little training can come in handy, such as when a child full of hope looks up at Santa with tear-brimming eyes and asks him to bring back a dead loved one. On a similar note, they also teach the Santas how to deal with times when a child will open up to Santa about things that they don’t tell others, like issues with being bullied, abusive parents, and more. Prospective Santa’s also learn how to politely turn down cookies, basic sign language to help in talking with with deaf children, and, in at least one Santa school, even how to stay in shape- and we mean this in the sense most people think of when talking about keeping in shape, not how to get a belly like a bowl full of jelly. For example, at Santa schools like the “Harvard of Santa Schools”, Charles C. Howard Santa Claus School, in Michigan, the exercise course is, in the words of co-owner Holly Valent, “not a popular class”, but one they insist on. Nobody wants a wheezing Santa who gets out of breath just lifting kids on and off his lap. As for Meath, he specifically has a regime of regular running and swimming to maintain an adequate level of fitness and stamina to portray everyone’s favourite immortal bearded champion of goodwill and seasonal cheer. That said, Meath is careful to not exercise too much, lest he lose Santa’s trademark belly, with Meath terming the look “organic Santa”, rather than using words like “overweight”. It should be noted here that those wishing to portray Santa don’t necessarily need to attend classes or courses, it’s just that they can help you be “more appealing to potential employers”. And on that note, top tier professional Santas can easily earn a year’s wages in a single month if they score a lucrative contract portraying Santa for one of America’s larger malls, or by supplementing their “chair time” income by attending corporate or private events. As such, a degree from a well-known Santa school that says you’re not just some guy in a suit, but a man fully committed to portraying Santa as realistically as possible is invaluable and can set you apart from the literal (and metaphorical) heavy competition you’re likely to face at such gigs. 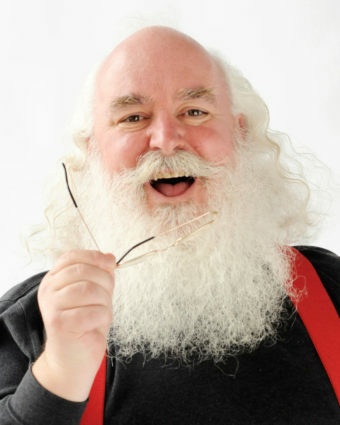 You are Santa 365 days a year… It wasn’t really a question of leaving my own job as it was to committing to the character. When you are Santa, you have a responsibility to the character, even when you’re in your private life. On that note, he, like so many other full time Santas, is quick to point out that when you wear the beard year round, so to speak, you have to be careful to embody the character in all aspects of your life, as you never know who might be watching your actions- a crossed word or raised voice could potentially ruin a child’s image of St Nick forever. At this point you might be wondering what exactly a year round Santa gets up to in the months of the year not labeled December. It turns out, for some of the top Santas, there really isn’t such a thing as a long offseason. Many ad campaigns targeting the season are planned out far in advance, resulting in Meath and those like him keeping fairly busy throughout the year. And, of course, when just walking out and about, while not in the suit, kids still often want to talk to who they believe Santa to be. This can sometimes even be a problem for professional Santas, such as in the summer of 2012 when one Thomas Tolbert, who was simply vacationing at Disneyland with his family, was unceremoniously booted out of the park for looking too much like Santa and refusing to turn away kids who thought he must be. You see, while he wasn’t in costume, many kids noticed the Santa impersonator sure looked a lot like Santa Claus in a t-shirt, and so started coming up to him to meet Santa; some even reportedly requested autographs. Not one to turn bright eyed children away, Tolbert happily obliged them. When this happened, Tolbert stated park officials approached him and first stated he should tell the children, “I’m sorry, I’m on vacation” so they’d leave him alone… But as Santa impersonators such as himself take the job seriously year round, he refused, and thus got the boot out of the park. In any event, to accommodate such year-round work and legions of adoring kids approaching him any time, Meath maintains a glorious white beard throughout the year, and is proud to be a member of the International Brotherhood of Real Bearded Santas, a group of professional Santas who similarly portray St Nick with natural white whiskers. Speaking of the group, in 2016, Meath explained that members meet up periodically to help each other hone their craft, which hilariously includes lengthy chuckling workshops, where Santas spend hours critiquing each other on their ho-ho-hos. As an aside, there is a long-standing rivalry between real bearded Santas and so-called designer bearded or “traditional” Santas (called “traditional” because it’s a relatively modern phenomenon that people portraying Santa have real beards). There’s even a degree of animosity between the two groups, with some real bearded Santas pushing to have owning a real beard be a standard requirement of portraying Santa in a professional sense. On the other side of the argument, the fake bearded Santas point out that their beards, which can easily run up into the thousands of dollars to buy when looking at the ultra-realistic ones, usually look far more like iconic pictures of Santa than the facial hair most men can grow. So if one really wants to play the part, they shouldn’t be cheapening the image with often inferior facial hair. In regards to Meath specifically, he has no problem growing a truly magnificent Santa beard, which he meticulously maintains using a litany of hair products to ensure his beard is fluffy, soft, and white as snow. Meath continues to portray Santa to this day, committing himself to the character of Kris Kringle in both body and spirit, maintaining both a glorious beard and a Facebook page where he occasionally posts selfies and pictures of Snowy landscapes. Because of course he does. When asked by NPR if he had to learn how to give a convincing ho-ho-ho, Meath explained that the moment you grow a fuzzy white beard you automatically learn to ho-ho-ho like a champ- it “[naturally] comes with the beard”. Typo in at least 2 places — There’s no “e” in Santa Claus.